So, you’ve been invited to an MBA interview. Congrats! First pop the champagne, then read this. If the thought of MBA interview preparation has your heart racing and palms sweaty, try to relax. Sure, your MBA interview is sort of a big deal… but the admissions committee sees potential in you! During the process of completing your MBA application, you already identified the reasons you want an MBA, why you chose the programs you applied to, and what your future career goals are. Good news! This is the same information you will need moving forward to the interview process so you’ve already done much of the work. Now you can take this knowledge and begin your MBA interview preparation. Think of your interview as an opportunity to breathe some life into your application. You already know that the school believes you are qualified on paper, now you must demonstrate those same qualities in person. If you followed our advice and were yourself when applying, this should come naturally! Take a deep breath, follow these tips, and you’ll have nothing to worry about. 1. Get to know your interviewer. If you think researching someone before meeting them is creepy then a) you’ve obviously never been on a dating app and b) ...think again. In the case of MBA interviews, it is important to know who is conducting your interview so your answers can take into account their background and position (admissions, student, alumni, etc.). This will also help you be less nervous about talking to someone you haven’t met before… especially someone who is so influential to your admissions. First, contact the admissions office to find out who will be interviewing you and then start sleuthing. Ask about that person’s professional background or relevant personal interests. Find them on the school’s website and search them on the internet for any relevant mentions (articles, journals, etc.). Remember: Your goal is to become familiar with your interviewer professionally, not to look through their family vacation photos. Think: LinkedIn, not Facebook. If you can’t find any solid information on your interviewer ahead of time, ask the interviewer if they can tell you about their own background before starting the interview. In general, people love to talk about themselves to willing listeners. By expressing interest in them, you can gain insight that will make your answers during the interview more interesting and compelling. While it’s important to convey (with credibility) that you are confident, ambitious, intelligent, and accomplished, these qualities will be more or less true about anyone invited to interview. 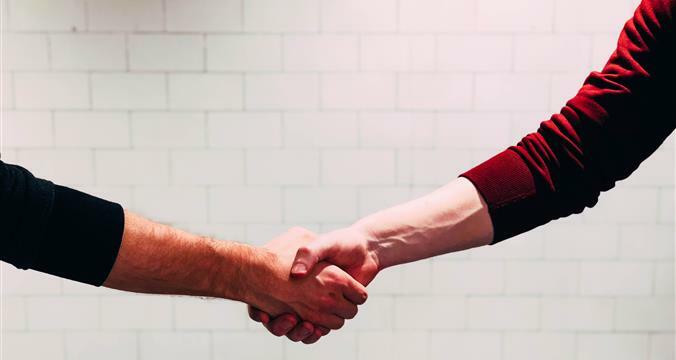 The best way to differentiate yourself from the other candidates is to connect personally with your interviewer and be someone that they really want to see at their school. In addition to the talents, accomplishments and recognition that make you a budding business superhero, interviewers are looking for candidates who can learn from, work with, and teach others. The way you answer will allow them to judge if you are a good fit for the school’s community and what you can contribute. This means that you need to even out your likability by being humble, engaging, and a good listener. This may seem a bit daunting at first, but after a few mock interviews, you’ll start to understand how to answer in a way that emphasizes your good qualities without coming off as arrogant or self-absorbed. To be most prepared, use admissions experts as a resource to provide you with a list of likely questions and give you feedback on your content and approach. Another key element to practicing your admissions interview is knowing how to approach tough questions. No matter how many trial interviews you go through, there is bound to be a question that comes hurtling out of left field. This is why it’s important to prepare not only the words you use when answering questions but your attitude while responding. The best answers always focus on your personal development, lessons you’ve learned, and the ways you’ve grown through making mistakes. But remember: It isn’t the end of the world if you don’t nail every answer. Stay composed, calm, and confident. At the end of the interview, it’s okay to ask to clarify your answer to a previous question. Most interviewers will allow you to revisit responses they didn’t feel were sufficient, and may even be impressed by your sense of reflection and awareness. As you approach your MBA interview, try to think of it as a conversation. Not only will this ease your nerves, it will also help you feel comfortable letting your personality and unique qualities as an applicant shine through. While it may be difficult to let your guard down at first, do your best to communicate calmly and with sincerity. At the end of the interview, you are welcome to turn the table by asking your interviewer some questions. After doing all your research and learning about them before the interview, it’s only natural that you will have some things you’d like to ask them. This is not only allowed, it is encouraged! Whether you would like to learn more about your interviewer’s personal experience in business school or gather additional information about the program to which you are applying, your questions will show your interest in the school and your genuine desire to be accepted. Tip: As part of your MBA interview preparation, do a quick stroll through their website to make sure that your questions aren’t answered there. Ask questions that show you have already done some research and are looking for more detailed information or first hand insight.